Ah sweet Sunday. How I love you. Family day, time to myself day, cooking day. Why must there be only one of you in the week! It has been 2 weeks since I’ve got to do the grocery shopping on my own, so today was savoured. I went to a cafe and drank my coffee while it was still hot! And read some of the newspaper (which was so depressing I had to stop). I had the lovely man at the fruit and veg shop carry my shopping to my car. I ran into friends and could chat without getting distracted. Trust me, I love my daughter beyond words. But to have a few hours just to myself is something rare and wonderful. The best bit? Coming home and having Possum give me a huge smile and a big sloppy open mouth heavy breathing 10 month old kind of kiss. The second best bit? Having Legoman home so the two of them can hang out while I plonk myself in the kitchen to make stuff! Hurray! 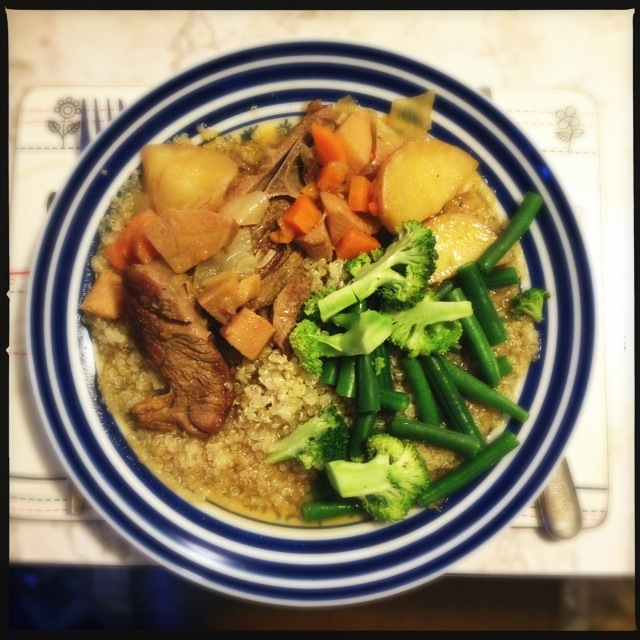 Our meat free week starts tomorrow, so I thought we could have a lamb stew as a final meat farewell. I even made the recipe up myself. And we lived to tell the tale! Double rainbow! 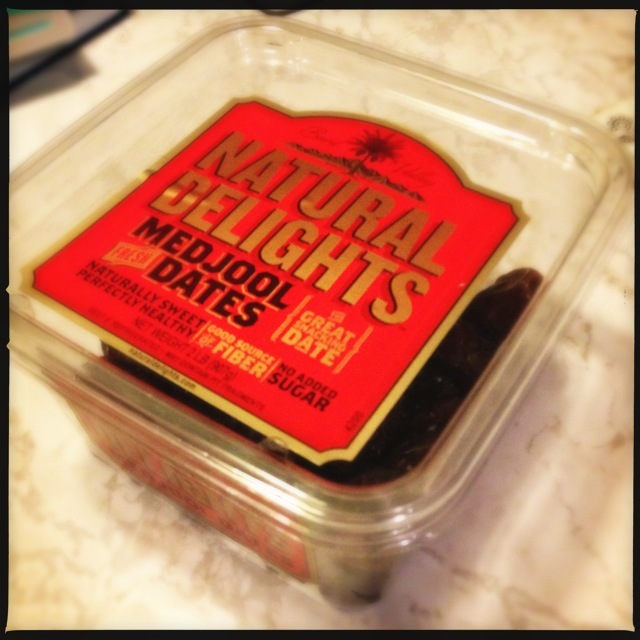 I also finally got around to using the medjool dates I bought 2 weeks ago to make my first “raw” sweet treat. I have seen so many recipes for sweets and snacks using fresh dates and a food processor lately. My poor little Possum is absolutely terrified by our food processor though (can’t blame her really, it sounds like you’ve got your head stuck in a jet engine). So my opportunity to use the darn thing is reserved to her awake time when Legoman is home to take out for a walk outside. Basically Sunday afternoons between 3 and 5pm. I didn’t get round to taking a picture before putting the yummies in the fridge, but i did get to have a taste test. Delicious! Will have to make something again next Sunday between the hours of 3 and 5pm! I will take the time to write out the two recipes from today for you. I’m really happy with how the lamb turned out and would love for someone else to give it a go and see if it worked out well for you too! The sweet recipe is super tasty and worth sharing! Enjoy! Preheat oven to 160 degrees (celsius). In a large cast iron casserole pot, heat 2 Tbsp olive oil over medium – high heat. Brown the meat in batches. Set aside. Turn down the heat to medium and add the onion. Cook for a minute until starting to soften. Then add carrot and garlic. Stir for another couple of minutes. Add your chopped vegetables and quince. Stir to mix. Add your meat, spices and stock. Stir to combine (as best as you can stir chops…). Put on the lid and place into the oven. Serve with rice, couscous or quinoa. I suggest steaming some vegetables for on the side. Grease and line the base and sides of a 11 x 21 cm loaf pan, allowing the sides to overhang. Place the dates, cacao powder, coconut oil, LSA, orange juice and orange rind in a food processor and process until smooth and well combined (mine turned into a giant ball). Transfer to a large bowl. Stir in the cranberries and pistachio. Dust a little extra cacao powder over the base of the prepared pan. Spoon in date mixture and use a greased spatula (I found just my hands worked best) to smooth the surface. Place in fridge for 8 hours or overnight until firm. Remove from pan. Use a hot, dry knife to cut into squares (mixture will be sticky). Affordability : MODERATE – EXCELLENT. In terms of meat dishes, stews are one of the most economical. They take advantage of lovely slow cooking cuts on the bone as well as combining with cheap veg like potatoes and sweet potato. Easy to feed a lot of people for not much. I picked up my chops on quick sale (I swear I have a special eye that can spot sale stickers from the car park). The 8 of them cost me $6.50. Time Factor : MODERATE. It does take a bit of time to chop everything and brown the meat. But once in the oven you can forget about it for 2 hours! Complexity : LOW. Easy peasy. This would also work in a slow cooker if you have one. I’m not sure how to convert a recipe over to slow cooker use though. Deliciousness : EXCELLENT. Not an overpowering flavour, but not dull or boring either. Just lovely. Mess : MODERATE. Browning the meat does send off a fair bit of fat splatter. But that’s easy to clean up. Otherwise this is a lovely one dish wonder. Tummy Filling Factor : EXCELLENT. Some steamed veg and carbs on the side complete this dish nicely. Possum Friendly? YES. Low in salt (none added apart from whatever is in the stock I used). Slow cooked meats and veg are perfect to offer bubs as they as soft and easy for them to digest. The veg also would’ve soaked up all the goodness that comes from cooking with bones. Highly nutritious. Just pull some meat off the bones as the chop bones are quite sharp. Would I make it again? Yes, I think I will. Maybe even for guests! « Meal Plan 22/3 – 28/3 a Meat Free Week Special! !